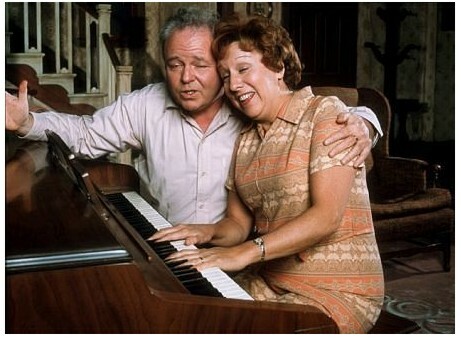 “Archie and Edith Bunker Are Playing That Song Again!” | "An Eclectic Array of Topics"
Hey everybody Sen. McCain and Gov. Palin and that whole Republican gang want you to dance to a “new song”! Ah, the days of the Robber Barons; when wealth flowed among the captains of the industry and the rest of us scraped our nickels together to buy bread. Wait one minute John McCain. Those wistful days that Archie and Edith longed for ended with Nixon’s shameful resignation, hmm…or so we thought. Now thanks to John and Sarah with an assist from Archie AKA “Joe the Plumber”… we can all rejoice that better times are ahead. Michelle Bachman Congressional Representative of Minnesota, with a great hand from Gov. Sarah Palin wants to know who is “Anti-American”? John McCain wants to have Barack Obama tell the truth, even though we have heard it from his Sen. Obama’s own mouth. Seems that Sen. McCain wants you to believe there is more to the story, similar to Joseph McCarthy. It is as if there were Black Elmo and Regular Elmo (just ask Rush Limbaugh) and bigotry can reign supreme once again. All you have to do is paint your opponent as Anti-American. Are you ready? All you need to do is suspend reality, not your campaign. One two, three, return with us, back to the Land that Time forgot. Remember when an Obscure Senator from Wisconsin (Joseph McCarthy) and Representative from California (Richard Nixon) made their careers from rooting out persons of whom they considered “Anti-Americans’? Well now, listen; as we speak, we can hear the howling form the Right has it reaches a fever pitch. Terrorist! Off with his head! Muslim, Arab, Socialist! Then today Thomas Sowell writing for the “National Review” threw Bolsheviks and Jim Jones into the mix. And what is getting all that dander up? It’s less than two weeks until the presidential election and the Republican brand of fear mongering ala Karl Rove has not worked yet, so why not dust off the playbook of the House Un-American Activities Committee of McCarthy and Nixon. When the Republican Party lost control of the House and Senate in 2006, their members thought is was because they had lost their principles of less taxes and smaller government. However, Americans wanted out of Iraq and to be able to pay their bills. Americans in the last two years they have learned of excess wealth of hedge fund managers and CEO’s while they struggle to cloth and feed their children. Now Sen. John McCain calls helping Americans… welfare. He really must long for those days. Now who’s is drinking the Kool-Aid? I laughed so hard reading this I thought I’d crack a rib. The things you write are so right on. This analogy was brilliant. Pulling Mc Carthy, Nixon, Linbaugh and Mc Cain together like this is a very accurate description. I’d have never thought of this. Your site is one of my favorites. Each time I visit, I never know what the topic will be. The one thing I do know is that it will be well researched and thought out. Originally I found your site through one of the articles you did in the NY Times. I enjoyed reading this article of yours funny,and so right.